Adobe recently had announced the new launches of Adobe Creative Cloud, the company’s flagship offering for creatives. The Creative Cloud for individuals and Creative Cloud for enterprise join Creative Cloud for teams, which was launched in March 2013 is now available for sale in India. 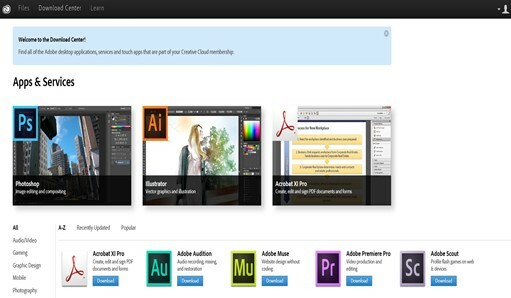 Adobe Creative Cloud is a subscription bases model for the popular adobe products. The Adobe Creative Cloud membership provides the users with the access or license to download and install various abode products like Adobe Photoshop CC, InDesign CC, Illustrator CC, Dreamweaver CC and Premiere Pro CC. Adobe’s desktop tools, previously known as Creative Suite (CS), are now branded CC to reflect that they are an integral part of Creative Cloud and have been reinvented to support a more intuitive, connected way of creating. This means that the members will also have easy access to the upgrade and all products in one place. What is the Cost of Adobe Creative Cloud Subscription? There are different plans and costs available for the users to try out the Adobe Creative Cloud. These include Free, Single App, Complete, Special Offers plan where each one of them has their own pros and cons. For example, with the complete plan, one gets the full versions of every app for approximately $50 with 20GB of cloud storage. You might be paying little more for the softwares taking the long run in to consideration but if you are a user and using the Abode products frequently and always wants to stay up to date with the softwares from abode. It might work out well in terms of the upgrade costs. Since the Adobe Creative Cloud provides the entire Creative Suite for the users, it provides the opportunity for the users to try out many software programs. Easy installation of the softwares also adds to it. With the new model, the users can get the new features without having to pay for the expensive upgrades. Additional tools like Digital Publishing Suite which lets the users to create iPad apps easily without writing line of code also adds more value.